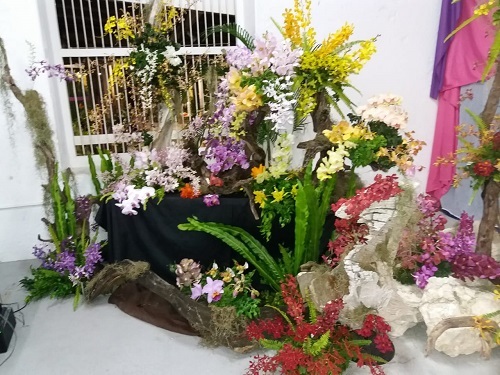 Trinidad and Tobago Orchid Society - What's new April 2019. The April Meeting will take place on April 28, 2019 at 10.00 AM. Location: St Xaviers, Primary School. -Turn right at the park (2 blocks up) and follow the road to the school. There will be a plant show table and a plant raffle. Below is a photo of the TTOS prize winning exhibit at the Barbados 80th Anniversary Show. 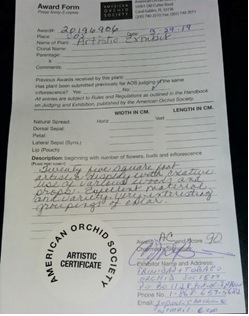 Please note the collection of cut orchid flowers exhibited at Barbados Orchid Society 80th Anniversary Show received an AOS award for Artistic Exhibit - 90 Points and three trophies were awarded to TTOS members' entries. 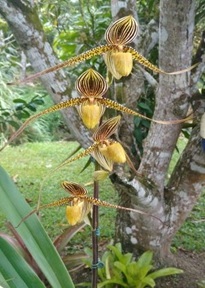 Copyright © 2003 TTOS - Trinidad and Tobago Orchid Society. All rights reserved.